General Manager Drake Maverick previews tonight’s two big matches – Kalisto v Lio Rush and Akira Tozawa v Drew Gulak. Vic Joseph, Nigel McGuinness, and Percy Watson are on commentary. 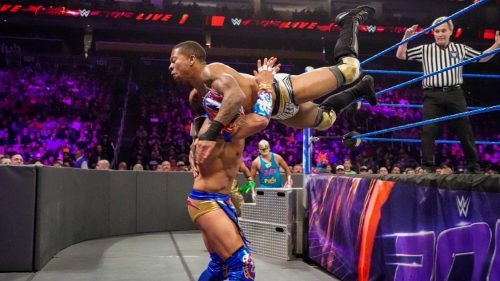 Kalisto (w/ Gran Metalik & Lince Dorado) defeats Lio Rush at 14:18 in a #1 Contender’s Match. This is a match of perhaps the two fastest athletes on the roster. Cruiserweight Champion Buddy Murphy and Tony Nese are watching on backstage. Both men show off that speed in the early going, and Rush takes the first advantage. Rush keeps Kalisto grounded, working on his left arm and shoulder. This goes on for quite a while, with Kalisto making sporadic comeback attempts. Late in the match, Rush appears poised to go for The Final Hour, but Metalik and Dorado distract him with their noise makers. Rush tries to goad the corner men into attacking him so he can win by DQ, but Dorado and Metalik successfully hold each other back. All that leaves Kalisto enough time to recover and hit Salida del Sol to get the pin. They worked a slower pace than I thought they would, but I was still digging it. Not a big fan of the finish though. Maverick is backstage, and he tells us that he’s been scouring the globe and talking to other GMs about bringing in some new faces for 2019. Sounds like a good idea to me. Akira Tozawa defeats Drew Gulak in a #1 Contender’s Match at 17:13. Murphy and Nese are also watching this match from an awkward angle backstage. Maverick ruled that The Brian Kendrick and Gentleman Jack Gallagher would be banned from ringside, due to all the tension between the teams in the recent weeks. They start this one on the mat, where Gulak would likely have an advantage. Gulak takes over early on and he targets Tozawa’s back. Tozawa proves why they call him “The Stamina Monster” by surviving Gulak’s attacks. McGuinness wonders why Gulak is striking rather than goin for a submission hold, which is great analysis. Tozawa comes back and goes for the flying senton, but Gulak catches him in the Gu-Lock but Tozawa fights it off. Gulak gets in position for a superplex, which is a huge deal for Mr. No Fly Zone. Nobody’s ever called him that, that’s just me. Tozawa knocks him back with a headbutt, and follows him down with the flying senton to get the pin and earn his way to the Royal Rumble. A very good match between these two, with plenty of time to let the match breathe. I love the finish, where the top rope caused Gulak’s demise. The Brian Kendrick comes out to celebrate at the end, while sideways Murphy and Nese scoff at them. Backstage, Cedric Alexander tells Hideo Itami that he will defeat him again, just as he did before when he was Champion. Elsewhere, Ariya Daivari and Itami say that this is not the same Itami as back then. Two good matches this week, and they make for interesting competitors for Murphy. Alexander v Itami next week should be good too. I love the direction of the title scene, and I’m very curious to see these new faces that Drake Maverick is promising. The purple brand just keeps on rolling.